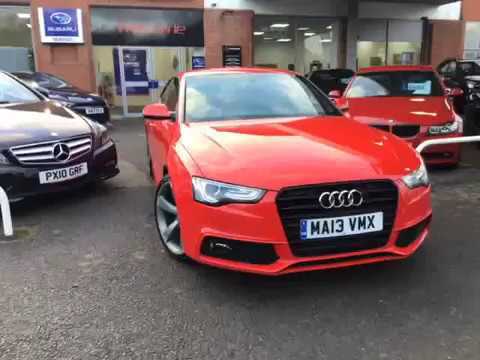 We like this A5 so much that we have put it in our showroom! This is a 2013 model Audi A5 S Line Black Edition, with £4,330 of optional extras and an Audi dealer service history. It is powered by a 2 litre diesel engine which is in CO2 Band C, with a combined MPG of 61.4 and 177 BHP. The stunning colour is Misano Red pearl effect paint, with dark grey 5 spoke alloys and black grill. Inside there is Technology Package giving you a 7 inch colour display screen with sat nav, Bluetooth, DAB radio and Audi Parking System Plus (front and rear parking sensors). Other specification includes heated front seats, cruise control, interior lighting package, 3-spoke multi-function flat-bottomed steering wheel, black piano finish interior trim and 6 speed manual transmission. Join us for a test drive at Pershore Sports and Prestige, WR7 4RD. Before delivery this car will have undergone our extensive pre-delivery inspection covering all mechanical and cosmetic aspects of the car. All our cars come with a complimentary 3 month warranty which is extendable, fresh oil and filter change and a minimum of 6 months MOT and service if required. All our customers benefit from our Pershore Motor Group Reward’s Club which gives you FREE MOTs for life, 6 free wash and vacs by our professional team of valeters per year, £250 off your next car purchase with us at any of our showrooms and a £100 refer a friend bonus scheme.